Rachael Mueller has been with ESR since 2006. She received her Ph.D. from Oregon State University in 2014, advised by Drs. Laurie Padman (ESR) and Eric Skyllingstad. As a NASA Earth and Space Science Fellow, she advanced research on how tides and topography influence ice shelf basal melting using the Regional Ocean Modeling System (ROMS). Her primary research focus was the Larsen-C and Filchner-Ronne Ice Shelves. She is currently funded through Akvaplan-Niva and supervised by Drs. Tore Hattermann and Laurie Padman to investigate the basal melting of the Filchner-Ronne Ice Shelves using the Finite-Volume, primitive equation Community Ocean Model (FVCOM). This research is important because it helps us to better understand how changing climate will affect Antarctica’s contribution to sea level rise. 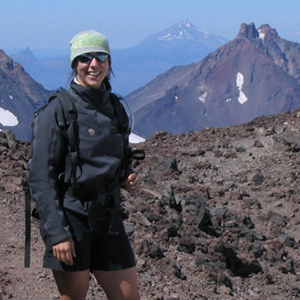 In general, Rachael’s research interests are to investigate planetary interactions across space and time to evaluate how the interplay between large- and small-scale dynamics affect the things that we care about, like sea-level rise, marine-sourced food, aquatic ecosystems, and our marine wilderness. She enjoys sharing this information with people from varied backgrounds through her writings, information discussions and formal presentations; see Other Publications, below. Ph.D. (2014) Oregon State University (Oceanography). M.S. (2006) Oregon State University (Oceanography). B.A. (2000) University of Colorado, Boulder (Mathematics). Mueller, R. D., L. Padman, M. S. Dinniman, S. Y. Erofeeva, H. A. Fricker, and M. A. King. 2012. Impact of tide-topography interactions on basal melting of Larsen C Ice Shelf, Antarctica, J. Geophys. Res., 117, C05005, doi:10.1029/2011JC007263. W.D. Smyth, B. Ruddick. 2007. Shear and Convective Turbulence in a model of Thermohaline Intrusions. Journal of Physical Oceanography, 37, 2534-2549. Syvitski, J.P.M., S.D. Peckham, R. Hilberman, et. al. 2003. Predicting the terrestrial flux of sediment to the global ocean: a planetary perspective. Sedimentary Geology 162 (1-2) 5-24. Jennings, A.E., K. Gronvold, R. Hilberman, et. al. 2002. High resolution study of Icelandic tephras in the Kangerlussuaq Trough, southeast Greenland, during the last deglaciation. Journal of Quaternary Science 17(8) 747-757. Arctic Warming & the Quieting of Winds Bring Whispers of Environmental and Economic Change to Oregon.